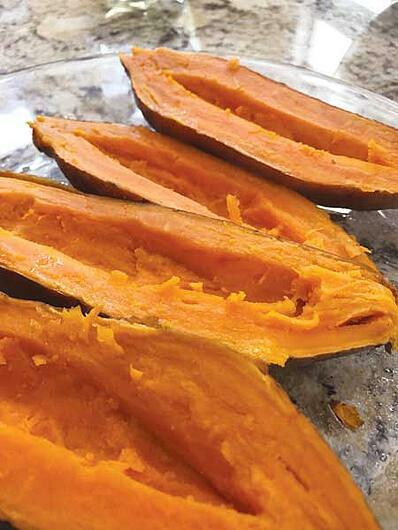 With all the pressure to eat healthily and try to incorporate fiber and “superfoods” into your diet, I have decided to create a recipe featuring a very well known but misunderstood vegetable, the "superfood" - sweet potato. Eating sweet potatoes can add a higher amount of dietary fiber to your diet. Dietary fiber is essential to losing weight and incorporating a sweet potato into your diet can fill you up (fibrous foods are more filling), and you will stay full longer because high fiber foods take longer to digest. Sweet potatoes are low in calories compared to a regular white potato. A medium sweet potato has about 100 calories per serving versus a medium white potato which can contain up to 400 calories per serving. The human body is made up of mostly water, it has been suggested to drink a glass of water before eating to eat less. Sweet potatoes are known to have large amounts of water, so when you eat them they tend to fill you up and help keep you full longer! Modifying recipes to be less caloric and nutritious has always been my passion. It seems like everyone is always trying to eat better so to equip my blog followers with healthy recipes for summer grilling fun, I have created a nutritious and delicious recipe. I did this by using a few well-known healthy and low-calorie favorites in moderation: Brie cheese, pecans, and sage butter. Use just those three ingredients and a sweet potato on your ElectriChef grill, and you will have my newest recipe, Brie Grilled Sweet Potatoes with Sage Butter. This cheese covered sweet potato drizzled in sage butter recipe may appear to be a caloric indulgence, but the reality is a single serving (1/2 sweet potato) of this recipe is about 178 calories vs. one serving of a loaded baked potato (1/2 potato) which is about 592 calories. Besides being big on flavor and low in calories, this dish is also packed with beta-carotene and is allowed on a paleo diet in moderation. Bring on the sweets baby...they will keep you looking good this summer! Place washed sweet potatoes on a Pyrex plate in the microwave for 8 minutes or until potatoes are fork tender, do not poke with a fork. Carefully remove sweet potatoes from microwave and set aside. NOTE: I will sometimes roast sweet potatoes on an earlier night in the oven if I am turning on the oven, I tried to plan ahead and make a couple of meals and store them in the fridge for another night. 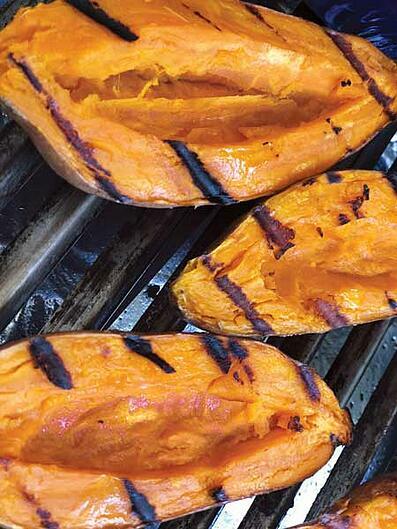 The sweet potatoes last up to 5 days in the oven and make a quick grill meal on a busy weeknight. Place butter and sage leaves in a grill safe saucepan or an aluminum loaf pan. Spray your ElectriChef grill grates with Canola oil then preheat your ElectriChef Grill to 500°F. 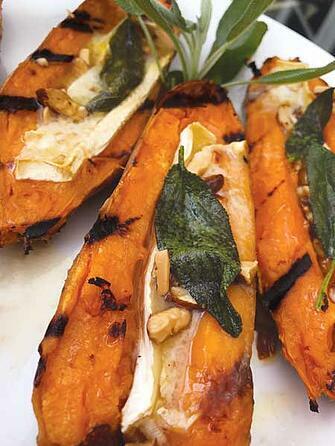 Place the cooled sweet potatoes on a cutting board and slice them long ways. Use a spoon to create a small well in the center of the potato. NOTE: The sweet potato that is removed from the well, can be frozen to be used in pancakes to add amazing flavored at another time. Place reserved sweet potato in a freezer bag and freeze. Using tongs, place sweet potatoes on your preheated ElectriChef grill flesh side down (as shown on photo) for about 5-6 minutes. Before closing the grill lid, place saucepan with sage/butter on the grill. Open grill lid and using tongs turn the potatoes, drizzle sweet potatoes with a small amount of melted sage butter using a teaspoon. Place one ounce of Brie in each of the wells in the sweet potatoes and sprinkle with chopped pecans. Take sage leaves from the butter and carefully place on the grill grated to sear. Return age to butter. Remove melted sage butter from the grill. Close grill lid for about 2-3 minutes and allow Brie to melt. Using tongs remove sweet potatoes to a presentation plate. Drizzle a small amount of sage butter and place a seared sage leave on each potato. 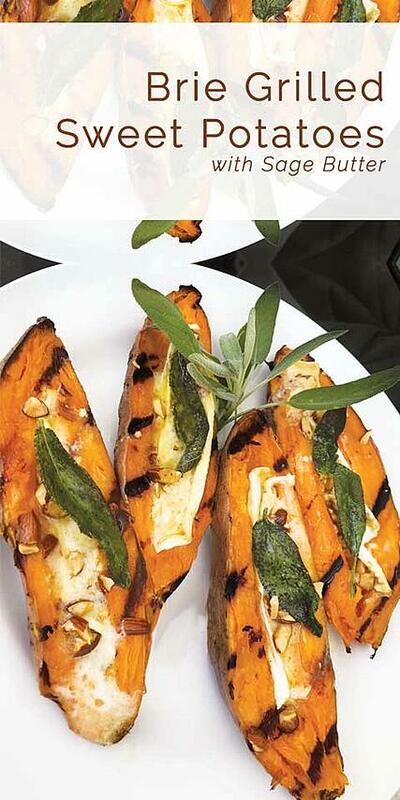 Sweet potatoes can be served as a side dish, or each one can be sliced into four pieces and served as appetizers. The entire sweet potato can be eaten. Most of the nutrition is in the potato skin which also holds most of the fiber. NOTE: It is important to note sweet potatoes and yams are different vegetables. The most important characteristic of a sweet potato is that it has smooth, thin skin and is very moist. They are usually very identifiable at a grocery store and are clearly marked. I prefer a sweet potato because they are “sweet” where a yam is very starchy.